2019 IT Salary Survey by company size and metro area. 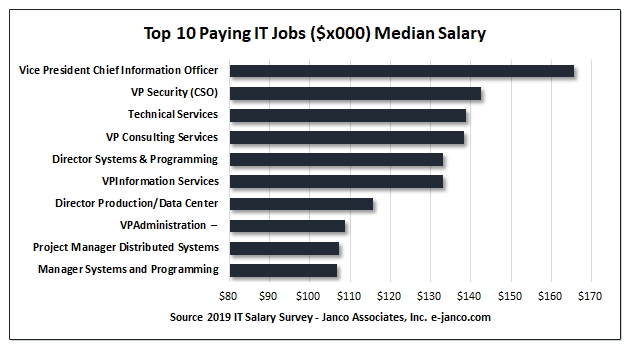 Janco and eJobDescription.com has conducted salary surveys of the IT Job market since 1989. The data from this survey has been published in the Computer Industry Almanac, the Wall Street Journal, the New York Times, eWeek, and many other business and industry publications. In addition over the years it has been featured on CNN, the Wall Street Journal, and several national and international media outlets. IT Salaries are on the rise. As the general economy improves more companies are investing in information technology. The emphasis over the past several years is in both e-commerce and mobile computing. At the same time with the ever-increasing cyber attacks and data breaches, CIO are looking to harden their sites and lock down data access so that they can protect all of their electronic assets. Added to that in an ever-increasing array of mandated requirements from the EU with GPDR and US federal and state requirements to protect individual users' privacy. All of these factors increase demand for experienced IT Pros and salaries they are paid. The salary survey is updated twice a year; once in January and then again in July. 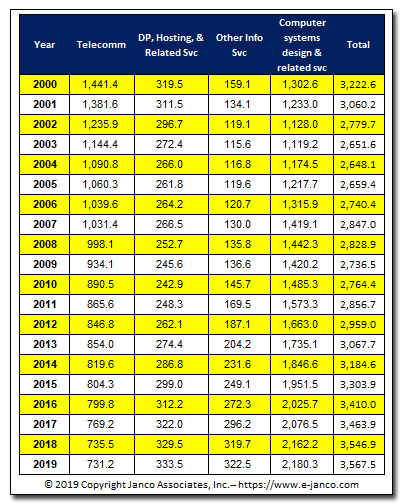 Janco and eJobDescription.com not only look at base salaries, they also report on total compensation. How survey is conducted is described here. You can get a free copy of the full survey if you provide 10 valid data points and use a corporate e-mail address. Free e-mail accounts like gmail or yahoo do not qualify as we have no way to verify the accuracy of the data provided. Are you paying too much or too little to your IT staff? Do you have IT job descriptions? Are you earning what you're worth? Whether employer or employee, it is important to know what other companies are paying in total compensation for a similar position in your area. Learn how your company compares in the area of compensation. Data is as of January 2019. In the last 12 months compensation for IT executives have fared better in large companies than mid-size companies with increases that were 3.89% versus 2.84%. In the last two quarters of 2018, staff level positions in IT organizations of SMB's had the greatest demand for new hires. Companies were gearing up their internal US-based IT organizations pushing IT salaries up by 2.40% from $87,254 last year to $89,348. IT compensation for all IT Professionals increased by 2.92%. Between the start of 2018 and the start of 2019, the total mean compensation for all IT Professionals increased from $90,439 to $93,077. In large enterprises, the median compensation rose 3.42% from $93,669 to $96,875. In mid-sized enterprises, the mean total compensation for all positions increased by 2.40% from $87,254 to $89,348. Over 80,000 net new jobs. Some markets like the SF Bay Area, Boston Metro, and Salt Lake areas are suffering significant shortages of qualified IT professionals. Technology centers like San Francisco (Bay Area), Chicago, Atlanta, District of Columbia, New York and Washington State continued to lead the way in new IT job creation. Many CIO in the larger enterprises are now getting closer to retirement. Succession planning and promotion of Millennials into that role is becoming a priority. Median CIO tenure has fallen by two months to 4 years and 5 months as retirements of baby boomers continue. Large organizations are planning to beef up their middle management as those enterprises focus on Big Data, Blockchain, SEO and Smartphone and tablet connectivity. Onshore outsourcing and H-1B visa jobs have peaked. The America first campaign has resulted in more infrastructure functions being moved in-house. Several enterprises are moving help desks and data center operations in-house which has resulted in an increased demand for data center managers. A new position was added to the survey – Web SEO Analyst as e-commerce continues to expand and search engine placement becomes more critical. KPI metrics are now the way performance is being measured. The compensation study (over 170 pages) in PDF and EXCEL with the data) can be ordered here. If you do not want to purchase the full salary study, you can get just the data for a particular city for a fraction of the cost of the full study. Hiring prospects are looking good for IT Professionals. Many enterprises are looking expand the size of the IT function as the economy continues to recover and application development increases along with the use of contractors and consultants. 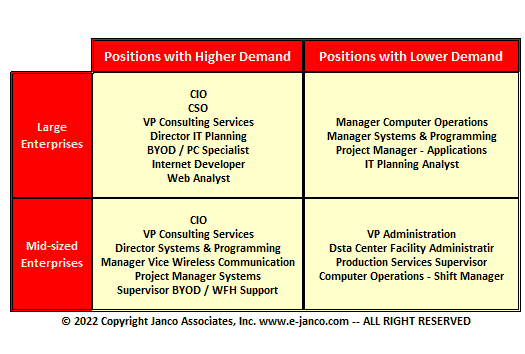 Based on Janco's interviews and survey data the following positions are in high demand. 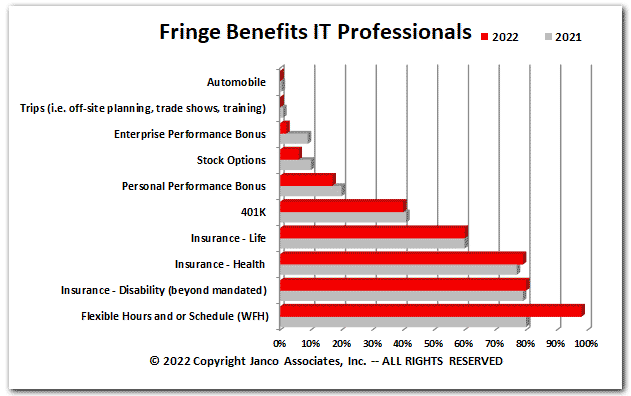 Companies have started to adjust the fringe benefits provided to IT Professionals. 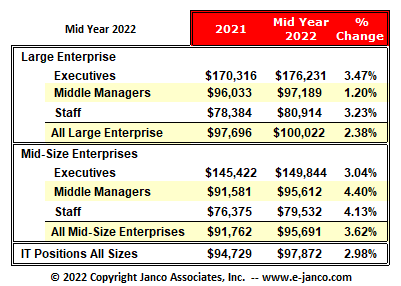 A full historical comparison of trends in benefits is included with the full version of the Janco IT Salary Survey. 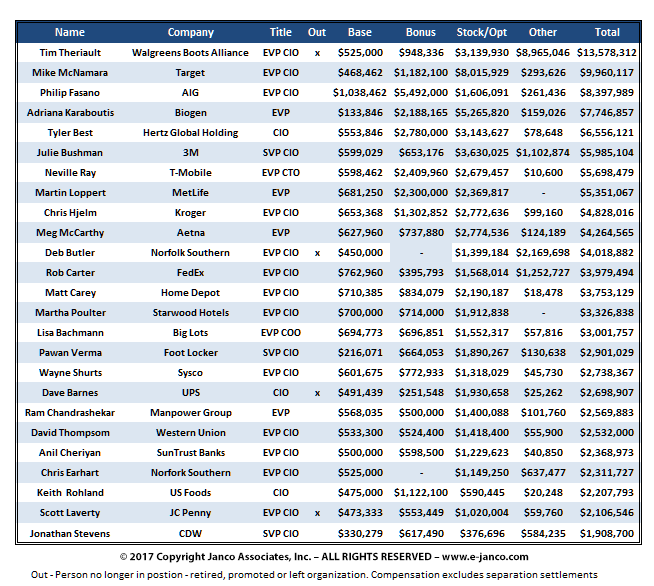 The top compensation for highest paid CIO is over $13 million and that is for Tim Theriault at Walgreen's. From public data we have found that there at least 25 CIOs who's compensation 1.9 million and above. The average total compensation for the top 36 highest paid CIO for the year ending 12/31/2015 was $3,600,000 with a base salary average of $510,417. The balance of compensation came from bonus, stock, options, and pension programs. 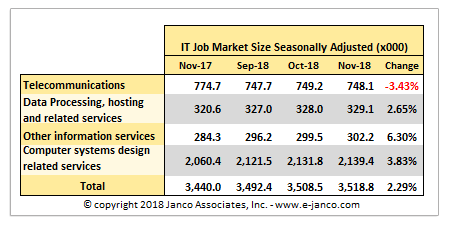 The IT job market now includes 3.5 million individuals. These are all high salary positions and critical to US economy.